I thought about making a pie today, in celebration of Pi Day (3/14). But truth be told, I'm not such a pie-making gal. It's the crust that intimidates me. My mom is a phenomenal pie maker. Her pies are the stuff of legend. She learned from her mom, who was also celebrated for her pies, with their perfectly balanced fruit fillings and their perfectly textured crusts. Not sure how or why I yearned to learn how to cook certain foods from my mom but not others. But that's how the cookie crumbled for me. So today, though I wanted to bake a pie, instead I baked a cake. I'm anxious for spring, so I wanted something light and fruity. Immediately I thought about an olive oil cake. I perused several recipes (like this one and this one) and then came up with my own. Preheat the oven to 350. Line the bottom of a springform pan with parchment and spray with a neutral oil. Combine the ricotta, olive oil, eggs, sugar, lemon zest and vanilla extract. Don't overbeat... this can all be done by hand. In a separate bowl, add the dry ingredients (flour, baking powder, baking soda and salt). Slowly add the dry ingredients to the wet ingredients and stir until fully combined. Next, get a clean bowl and pour in half of the batter. Add half of the blueberries to half of the batter. This will be the bottom of the cake. Pour this into your springform pan. Add the remaining batter on top of this cake and decorate with blueberries as you'd like. If you'd like to make it easier, you can combine all of the batter and all of the blueberries. This method is best if you have a design in mind for the top. When you have finished designing your blueberry top, bake for approximately 35 minutes. the top will be slightly golden brown and the texture inside will be moist and delicious. I've got a sweet tooth but funny enough, I really don't like things that are too sweet. I'm all about the hint of sweet. So when I came across this recipe from Saveur for Olive Oil Quatre Quarts with Chopped Fruit, it looked right up my alley. First of all, it has no dairy, which is a huge bonus for a dairy free gal like me. Second of all, I just love the flavor of olive oil desserts. I had everything on hand for this recipe and it was easy enough to whip up while my kiddos were nodding off to sleep last night. I made two changes to the original recipe – I used blueberries instead of peaches or plums, and I used a very fragrant olive oil instead of a bland and sweet variety, as the recipe called for. Yum-oh. I initially cut this into squares because it's such a dense, rich cake and I thought it would be best in small portions. But alas... the squares were bite sized and perfect and I just kept popping them into my mouth! So I cut larger slices to stop myself from eating the entire cake! I had a slice for breakfast this morning, truth be told! We all need departures from the healthy norm, eh? Scroll down for the recipe as I've slightly modified it (and special thanks to Saveur for the original recipe!). 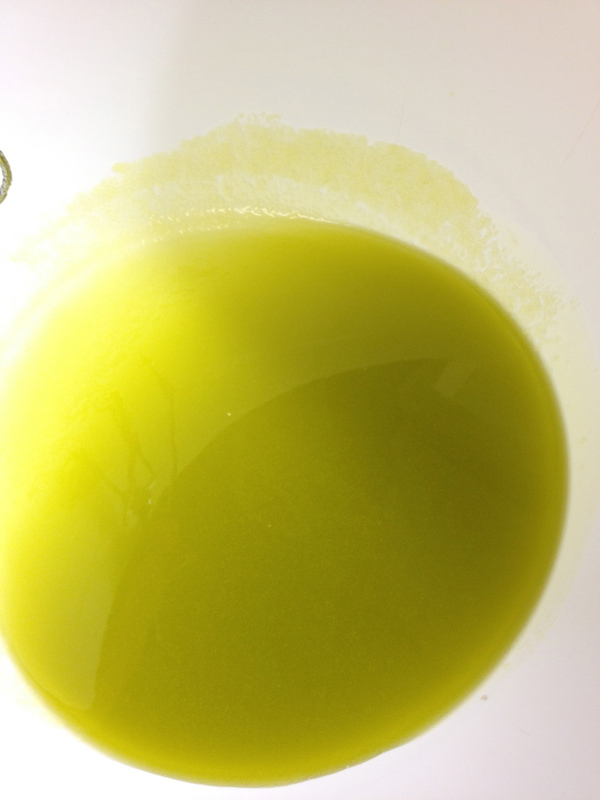 I began with olive oil from Frankies 457 - my favorite! Chock full of juicy blueberries! And cooked in parchment paper to reduce cleanup time. More batter and more blueberries. Oh, sweet (not too sweet!) deliciousness. 1. Preheat the oven to 350ºF. Line an 8x8 dish with parchment paper. 2. Measure the sugar and place in a mixing bowl. Remove a two tablespoons of the sugar and set aside. 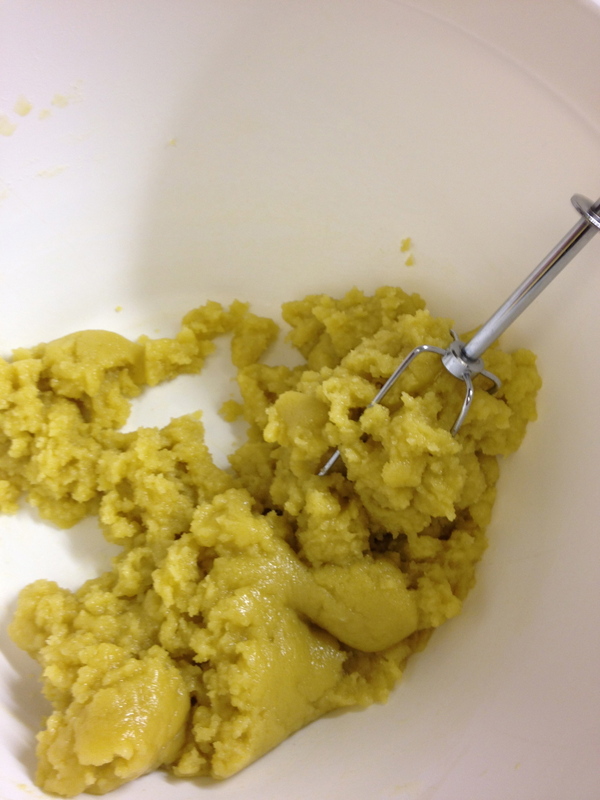 Add the olive oil and beat with a hand mixer until combined. 3. Separate the eggs. Add the yolks to the olive oil mixture and put the whites aside. Mix in the yolks. Slowly add the flour to the olive oil mixture, making sure to mix thoroughly before adding more. Add the salt and vanilla extract. Set the batter aside. 4. In a separate bowl, beat the egg whites to soft peaks. Add the two tablespoons of sugar that had been set aside and continue to beat. Slowly fold into the batter using a spatula. 5. Pour half the batter into the 8x8 dish. Rinse the blueberries and pat them dry. Add about 3/4 of the pint on top of the batter and pour the remainder of the batter over them. Place the remaining 1/4 pint of blueberries on top. Bake for approximately 45 minutes.